China’s massive push to deploy fibre to the home (FTTH) across the nation will spark a round of core network upgrades that will raise the fortunes of Western optical suppliers, according to market research firm LightCounting. Reporting from the Optinet China 2016 conference in Beijing in June, even Vladimir Kozlov, the experienced founder and CEO of market research firm LightCounting, was surprised by the scale and speed of optical networking projects in China. With 120 million households enjoying fibre to the home broadband connections, China is already home to half of the world’s FTTH subscribers. More than 50 million of these FTTH connections were added in 2015 and another 40 million customers will be connected this year. Projections for FTTH deployments show China reaching nearly 300 million subscribers by 2020 (see figure). Kozlov notes that, despite this aggressive and impressive roll-out, China is only ranked number 89 in the world by Akamai in terms of actual broadband speed (see Fourth Quarter, 2015 State of the Internet Report). ‘Improving this ranking will require an acceleration of upgrades to the rest of the networking infrastructure in China,’ he noted. LightCounting, which tracks optical transceiver shipments, has reason to believe that this acceleration has already started. Current market indicators for optical components and modules suggest that a fresh round of upgrades is already underway. As part of its latest quarterly market tracker, LightCounting reported strong demand for 100G DWDM optics in metro and long-haul networks across China. Extended reach (40–80km) 10G optics used in metro-access applications are also enjoying very strong demand, further straining the industry supply chain, the firm found. Home-grown vendor Huawei is enjoying much of that business – shipping more 1000G DWDM ports globally in the first quarter of 2016 than all five of its nearest competitors combined, the analyst firm found. A significant fraction of the 100G DWDM ports shipped by Huawei in that quarter went to China Mobile, with shipments to China Unicom starting to pick up in the second quarter, according to LightCounting. However, while deployments of FTTH and wireless fronthaul optics were mostly supported by Chinese transceiver vendors, the current upgrades to core networking infrastructure in China will directly impact all the leading Western companies, LightCounting asserts. Finisar, for instance, avoided the high-volume but low-cost FTTH market, and was very selective about taking orders for wireless fronthaul products, says Kozlov. The company views high-end 10G and 100G optics as its main market, however, so is likely to want to jump right into the latest round of core network upgrades. The same is true for transceiver suppliers Fujitsu, Lumentum, Oclaro and Sumitomo. Broadcom (through its purchase of CyOptics) and Mitsubishi Electric – key suppliers of 10G and 25G lasers for extended reach 10G and LR4 100G products – can hardly keep up with the demand in China already, according to Kozlov. ‘Even as upgrade projects in China are accelerating, the rest of the world is not standing still. 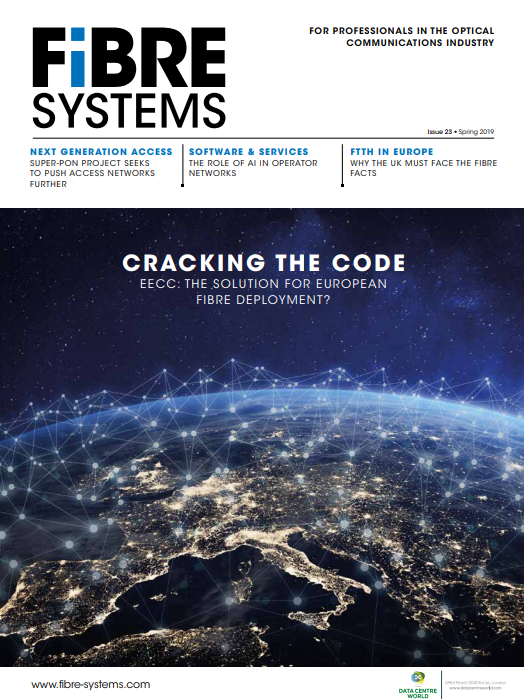 Service providers in Europe and North America continue to install 100G DWDM optics and cloud companies are ramping massive deployments of 100GbE connectivity in mega-data centres. It will be a very busy year for the suppliers of optics, but it is a good problem to have,’ Kozlov concluded. Image: Redrawn from a presentation by Leping Wei of China Telecom at Optinet China 2016. Cignal AI’s Optical Customer Markets Report, covering quarter 4 of 2018, found that operator spending on optical hardware grew almost 50 percent year-over-year. The High Court of Justice has ruled in favour of the UK’s Advertising Standards Authority over its decision on the use of the term ‘fibre’ in advertising. The Engineering and Physical Sciences Research Council (EPSRC) has committed a £4.9 million grant to fund a national research facility to support UK researchers in creating communications networks for the future.